The activity is intended to teach the life cycle of a butterfly. Students will role play and draw the various stages an insect goes through to become a butterfly. a. Students know different plants and animals inhabit different kinds of environments and have external features that help them thrive in different kinds of places. b. Students know both plants and animals need water, animals need food, and plants need light. c. Students know animals eat plants or other animals for food and may also use plants or even other animals for shelter and nesting. Objective: Students will role play and draw the various stages an insect goes through to become a butterfly. 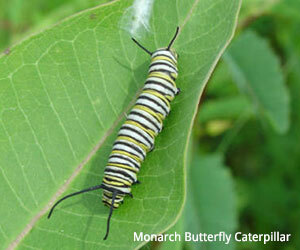 Know the stages a butterfly goes through: egg...larvae...pupa...butterfly. Butterflies emerge from chrysalises; moths emerge from cocoons. Some butterflies reflect in their wing color things they have eaten. There are some differences in moths and butterflies: butterflies have balls on the end of antennae; many butterflies have a smaller thorax than moths; butterflies have 3 main body regions (head, thorax, abdomen); butterflies have 3 pairs of jointed legs; butterflies have one pair of antennae. "Boys and girls, I am going to do a magic trick, and I want you to watch very carefully what I am about to do." Get an ordinary string and stretch it out... (Keeping one hand clutched in a ball with a paper butterfly inside)... as children watch, slowly stick the string inside the balled up hand from the top. When the string is all inside, tell the children something magical is happening to the string. Have them count slowly to three and then pull out the butterfly from the bottom. While you are flittering it around with the other hand, the one holding the string sticks the string in your pocket. Students will be amazed! 'Today we are going to see the different stages a caterpillar goes through to become a butterfly... like my string caterpillar did. I will do this again at the end of the lesson and let you in on my secret... but you must be good listeners." Read the story, The Very Hungry Caterpillar by Eric Carle. Stop periodically to ask questions to internalize the story. Choose the best listeners to act out the story. One child can be the caterpillar and other children can pretend to be the food items. The caterpillar begins in a ball position until it hatches. It crawls out and around as the story is re-read and eats the food. It crawls under the sheet (chrysalis) and puts on wings... when the story is over it emerges as a butterfly. As students go through the role playing, stop at various intervals and tell the scientific name for the stage of the caterpillar. Conduct the "magic trick" again. This time slow down so students can see what happened. Give them a piece of string and a butterfly to try on their own. Students will be allowed to take the string home and demonstrate it to a family member. In their journals, students should draw the various stages a butterfly goes through. Students may label the pictures using invented spelling.